Connect the grow light and turn on the power. Next, single click the switch key and grow light start to work. At this time, you can set the working hours of the grow light by clicking the Time off key. For example, if you set the working hours of the grow light as 3H, the grow light will be turned off automatically after 3H. Connect the grow light and turn on the power. Next, click the Time on key to set the starting time of grow light's working and click the Time off key to set the ending time of grow light's working. (Do not click the switch key). For example, if you set the starting time as 3H and the ending time as 3H, the grow light will start to work automatically after 3 hours and be turned off after 3H of working hours. Connect the grow light and turn on the power. Next, click the Time on key to set the starting time of grow light's working. For example, if you set the starting time as 3H, the grow light will start to work automatically after 3H. Additionally, you need to turn off the grow light manually. Connect the grow light and turn on the power. Next, single click the switch key and grow light start to work. In this situation, it will keep working until you manually close it. 1.Press the dimming button adjust the among 5-level brightness.20%,40%,60%,80%,100%. 2.Press the timing button to set timers. 3/6/9/12/15H. 【5 Dimmable Modes】 This upgrade version is ultra bright, lower heat and lower power consumption, high luminous efficiency and long service life(more than 50000 hours). It has 5 Dimmable Levels brightness, you can adjust it according to plant needs. 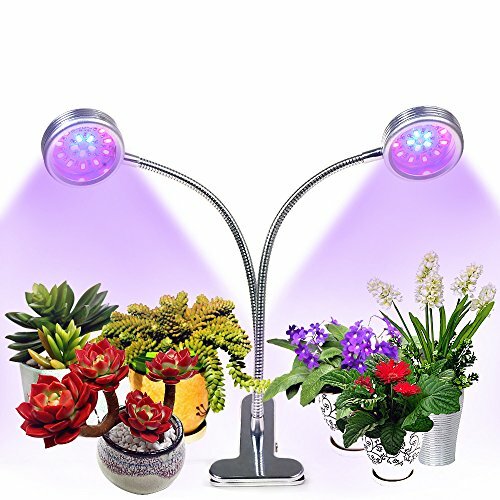 【Adjustable gooseneck & Easy to use USB Interface】Adjustable 360 degree gooseneck makes the light in any direction and can cover a larger area and provide energy for more plants.The USB interface and stronger clip design apply to any place at your home or office. 【Widely used in various types of plants】16W growing lights are widely used in indoor plants, seedlings, hydroponics, greenhouse, garden, home and office. Accelerate the growth of potted plants, foliage plants, flowering plants and succulent plants. 【Warranty】 30-days money back,1 YEARS quality assurance and lifetime customer support. If you have any problems with our products, please contact with us at any time. We will try our best to solve your problem. If you have any questions about this product by CLkj, contact us by completing and submitting the form below. If you are looking for a specif part number, please include it with your message.